Eternally Irish will create a memory that is unique to you, your family and your loved one. We will personally arrange to collect the ashes of your loved one from any location worldwide. We will then repatriate your loved one’s ashes to Ireland where a selection of ceremonies are available (See below). All of our services are photographed or video recorded for your memories. This provides you and your family with the most incredible personalisation of your loved one’s repatriation. You will also enjoy all the features of the premium subscription which allows you to create an online memorial for your loved one. 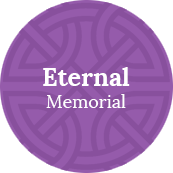 Contact us to find out more about our exclusive 'Eternal Memorial'.